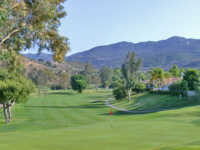 For those searching for Escondido tee times, Castle Creek Country Club discount tee times make it possible to enjoy this 18 hole, beautiful course, located just 40 miles north of San Diego. This par 72 layout plays a total of 6,688 yards from the back tees, with a slope rating of 136. The course was designed by Jack Daray and features thick, tree-lined fairways, many sand bunkers, two lakes, and a creek that runs through the course, bringing those water hazards into consideration on nine different holes. Two of those holes are short par 4s, the 3rd hole plays 295 yards from the tips, and the 13th, which plays 290 yards. Both require navigating the creek if you want to try and get close to the green from the tee. Castle Creek Country Club has a practice putting green near the clubhouse, but also offers a number of practice areas located around the course, and they offer lessons from their experienced staff for individuals, groups, and juniors. Other amenities include their full service restaurant offering breakfast, lunch, and dinner, with a sports bar feel. Discounts are available for golfers looking for cheap golf in Escondido, and many of those who have done so have had good things to say about their day, remarking that they found the fairways well maintained, and the greens were excellent.